Notre Dame turned in a dominant first half performance against a young Georgia Tech team. The Irish outscored the Yellow Jackets 28 to 10 in the first quarter and 26 to 3 in the second to lead at the half by a score of 54 to 13. The Irish assisted on 9 of 11 first quarter shots (11-18 for 61.1%). Marina Mabrey had four assists in the first quarter and made her only field goal attempt — a three-pointer. That was a sign of things to come as Mabrey made 6 of 7 threes for the game and ended up the game’s high scorer with 20 points. 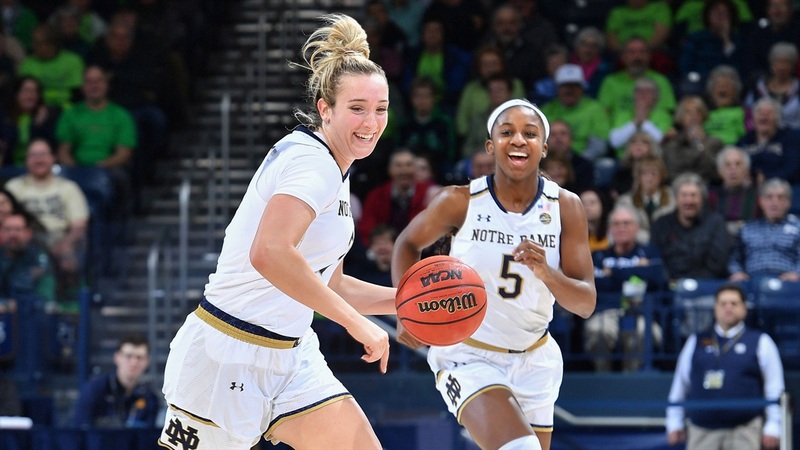 Jackie Young led ND in the first quarter with 10 points and Jessica Shepard added 8. Georgia Tech called time out just over three minutes into the game after the Irish scored on a fast break to make the score 12-6. The Yellow Jackets only scored four more points in the quarter and went on a scoring drought that lasted from the 3:54 mark of the first quarter until the 2:52 mark of the second quarter when Lotta-Maj Lahtinen made a corner three for the Yellow Jackets’ only basket and points of the second quarter. ND went on a 24 point run during the Georgia Tech drought. In the second quarter, the Irish made 9 of 15 shots, including another three-pointer from Mabrey. All five starters scored in the quarter with Arike Ogunbowale leading the way with 7. Mikayla Vaughn scored 3 and Dani Patterson 2 as the Irish built the lead to 41 points at the half. Georgia Tech opened the second half on a 4-0 run, but Mabrey quickly put an end to that with back-to-back-to-back three-pointers to create her own 9-0 run. Georgia Tech played hard, pressed, and pounded the offensive glass with 10 offensive boards in the quarter leading to 13 second-chance points. They scored a total of 17 in the quarter to 20 for ND. Mabrey had a fourth three-pointer in the third quarter to bring her point total to 20. She joined Turner and Shepard on the bench and none of the three played in the fourth quarter. The Yellow Jackets kept the press up until the very end of the game and managed to outscore the Irish reserves 20 to 16 in the final period. 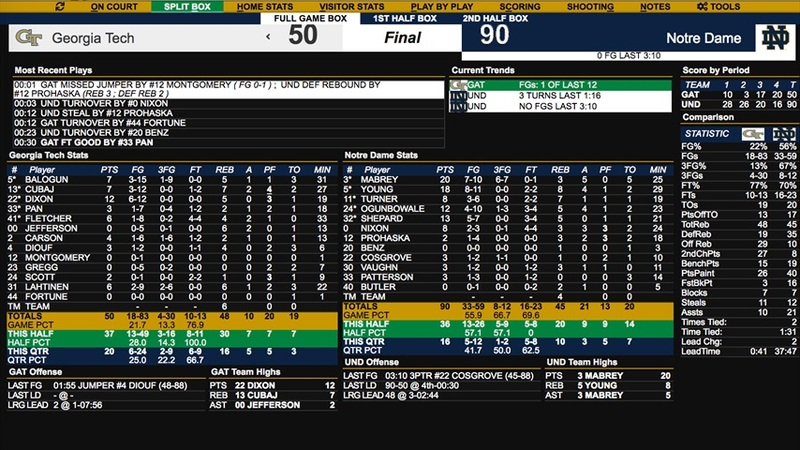 Georgia Tech collected another 10 offensive rebounds leading to 8 second-chance points, and the press caused 7 ND turnovers. For the game, Georgia Tech out-rebounded Notre Dame 48 to 45 — primarily due to 29 offensive rebounds. The Irish ended up shooting 55.9% from the field and 66.7% from three. They had 21 assists on 33 made baskets. In addition to Mabrey’s 20 points, Jackie Young added 18 to go with 8 rebounds, 4 assists, a steal and a block. Shepard scored 13, Ogunbowale tallied 12 and Brianna Turner added 8. ND had 19 points from the bench led by Jordan Nixon’s 8. Vaughn, Patterson and Danielle Cosgrove each had 3, and Abby Prohaska added 2. Nixon played a solid floor game in 24 minutes of action. She was 2-3 from the field, 4-4 from the line, with 3 rebounds, 3 assists, and a steal. She had two turnovers, but one was a carry called at mid-court with just 4.4 seconds left. Prohaska played 18 minutes, Patterson logged 14 minutes, but Vaughn had to leave the game in the third quarter after playing a total of 11 minutes. She went to the sidelines after going down under the Tech basket with an apparent knee injury. After the game, McGraw said that Vaughn hyper-extended her knee and should be back for the next game. 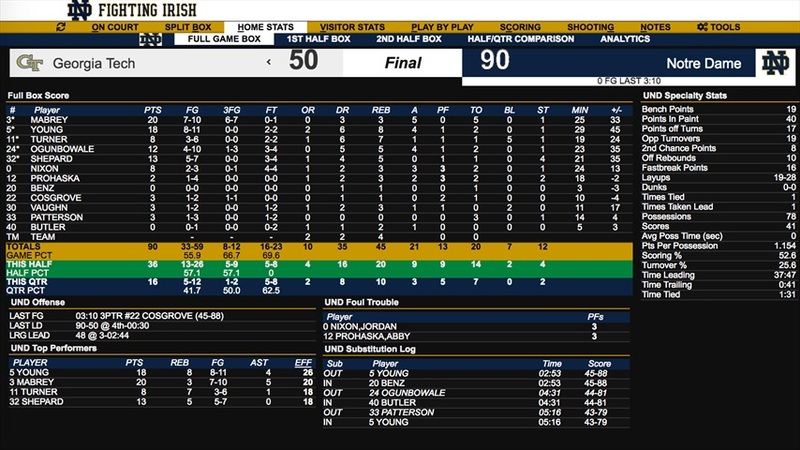 Georgia Tech had only one double-figure scorer. Freshman Elizabeth Dixon had 12. Leading scorer Elizabeth Balogun, who had 35 in the Jackets’ last game, only scored 7. For the game, Georgia Tech only made 18 of 83 shots (21.7%). They had 49 shots in the second half thanks to 20 offensive rebounds. The Yellow Jackets’ record now stands at 13-9, 3-6 in the ACC. The Irish improve to 21-2 on the season and 8-1 in the ACC. Notre Dame goes back on the road this week to play Miami in Coral Gables at 7 pm eastern. The game will be streamed via ACCN.